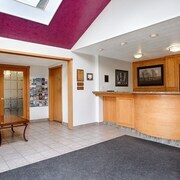 Where to find Brule hotels near an airport? Where can I find hotels in Brule that are near tourist attractions? Traveling to Canadian Rockies? 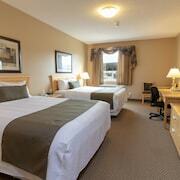 Would you prefer to book a place to stay close to the downtown area of Brule? You'll find 2 Expedia-listed hotels within a 0.1-kilometre (0.06-mile) radius of the downtown area. 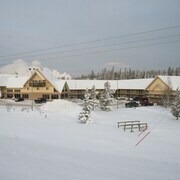 Our hotels within driving distance of Brule include the Overlander Mountain Lodge and Jasper East Cabins. 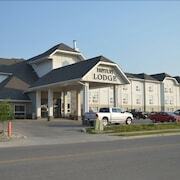 The Holiday Inn Hinton is 20 kilometres (12 miles) from the center of Brule. Or, alternatively, the Pocahontas Cabins is situated 13 kilometres (8 miles) away. Another possibility is to book a bed at the White Wolf Inn or the The Crestwood Hotel. 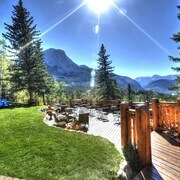 Why don't you take the time to visit the other sites to be found in Canadian Rockies while you are in the area? Explore Canadian Rockies' nature museums and history museums. Lovers of nature can also take the time to enjoy its forests, rivers and streams. Adventurous travelers might enjoy snowboarding here. Jasper is 50 kilometres (32 miles) to the south of Brule and is home to the Jasper National Park and Marmot Basin. 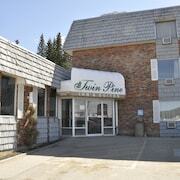 If you'd like to stay in Jasper, check out the The Fairmont Jasper Park Lodge and Best Western Jasper Inn & Suites. 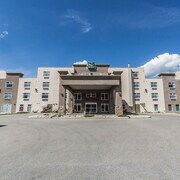 Alternatively, you could consider staying at Hinton, 19 kilometres (12 miles) to the northeast of Brule, where you can pick from the BCMI Inn Hinton and Quality Inn & Suites. Regardless of whether you're passing through or spending a few nights in Hinton, be sure to visit the Hinton Golf Club and Alberta Forestry Service Museum. If sport is what you love, be sure to visit Dr. Duncan Murray Recreation Centre, which is 20 kilometres (14 miles) to the northeast of Brule. If you are keen on booking accommodation nearby, make a reservation in the Holiday Inn Express Hotel & Suites Hinton or Super 8 Hinton. Grande Prairie Airport is situated 220 kilometres (135 miles) away from Brule. 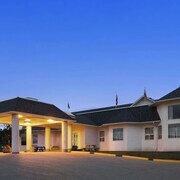 If you wish to stay nearby, you can easily book a room at the Paradise Inn & Conference Centre or the Stanford Hotels and Resort. What are the most popular Brule hotels? Are there hotels in other cities near Brule? What other types of accommodations are available in Brule? Explore Brule with Expedia.ca’s Travel Guides to find the best flights, cars, holiday packages and more!